OK, 2017 is over. 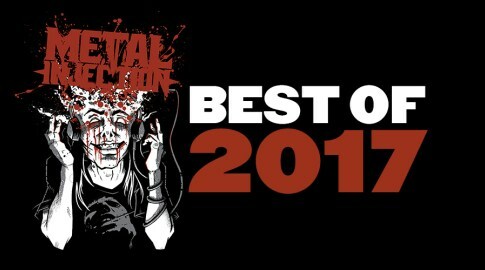 I wrote a top 15 list for Metal Injection. You should read it here. Buy the music from the bands on the list. Buy their merchandise. Go to their shows. Give them excessive amounts of money and attention because they deserve it. Working with Metal Injection has been one of the highlights of my year. I started 2017 writing reviews for an audience of literally nobody, and the dozens to ~hundred hours I put into it bore no fruit for months. That sucked, but I pretty much knew that was how it was going to go. I’m glad to have a major platform in Metal Injection to promote my heavy metal writing and it’s nice to see my material actually get decent online circulation. Hopefully I’ll be able to expand on that in 2018. I’m also genuinely glad to know that there’s a chance — however minor — that my writing for Metal Injection has positively impacted the metal music scene. Like everyone else that writes about this kind of music, I have a few bands that basically nobody else knows about and having a chance to rep them on a website as large as Metal Injection might connect them to a swath of new fans. With luck, anyway. Anyway, if I had time, I would’ve liked to expand this to a top 20 list. Unfortunately, being sick and covering the Thomas Fire in Ventura County strapped me of both time and creative energy. As for the music in my list’s “Honorable Mentions,” I’m confident that the “NieR: Automata” soundtrack would’ve placed fairly high on my actual list if I had had more time to listen to it. Ah well. That’s a phenomenal game with a phenomenal soundtrack. As mentioned, you should buy it. That’s all. See you in 2018. This entry was posted in Uncategorized and tagged music by tylerhersko. Bookmark the permalink.